Not a lot this week. We've got another Freebie Friday post & I think I'm going to keep it up as a regular post. You can check it out Here, some of them might still be free. STEAMPUNK BOOKS GIMME :D I hope you enjoy them all! No Hero is really.good, happy to see you got it. Your library is so cool to have Kiss Of Steel! Ours doesn't have a lot of steampunk books. You got you a Steampunk book too this week, I saw :) Thanks for stopping by Lauren! Great Haul. 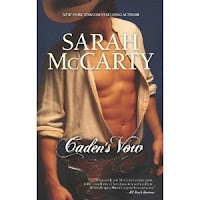 I also got Caden's Vow.